It is with a heavy heart, that I share these words about our dear friend, Sam. I don't know much about Sam's origins or early puppyhood. 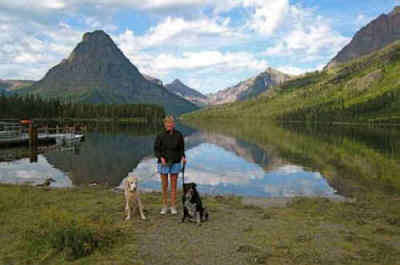 He was found in Glacier Park, young and abandoned. I've always suspected he was a reservation dog because I see what looks like a lot of his cousins whenever I drive through East Glacier or Browning. Sam was one of the smartest dogs I've ever met... probably attesting to his obvious border collie mix. But the thing I miss most, and will always miss, is his eternally happy and loving spirit. Below is a photo of Laurie with Sam and Nahanni at Two Medicine last August. (Nahanni is our yellow lab who is also nearing the end of her time with us at almost 15 years of age.) Below the photo are some thoughts about our Sammy in a narrative/letter poem. The life that steps and sings in ways of death. Sammy, these are days when the sun closes like a fist, and I have no idea how to tell you about the bog orchids blooming along Peters Ridge or the ground squirrel that got in the garden today. And God knows that I will never understand how you lived in-between the animal world and my world, or the love that flowed like a wild river sweeping us down fragile canyons until one day you disappear beneath the surface, and I catch my breath trying to find my way back in that hungry current. This morning I touched the paw-marks on the door that you scratched when you wanted in. Later, I held close the blue dish that you carried around when you were hungry. And, oh, how well you read us: You knew that the jingle of keys promised a car ride, and when I pulled on my chore boots or Laurie picked up the clothes basket, you were ready at the door for any happy, outside adventure. Camping gear meant Two Medicine, Freezeout Lake, or the Missouri River, and you could hardly contain yourself. Evenings, when the ten o'clock news ended, you headed for the stairs and waited for me to help you (as you got older) up to the bedroom. Your wolf guide rode on your shoulder: When Laurie or I returned home, you blessed that joyful pack reunion with raised lip and bared teeth, a fierceness betrayed by a wide, toothy grin: Smiling Sam’s cheerful badge. It seems hopeless, Sammy, to try to finish this poem because all I want to say will be said a thousand times better next spring by the lilac tree above your grave. My best words always end in longing for what can not be fulfilled in time: Death’s own death.